From clifftops to traffic-free parks, the capital of Peru is a treat for runners. I was staying in the upmarket and popular Miraflores district of Lima. 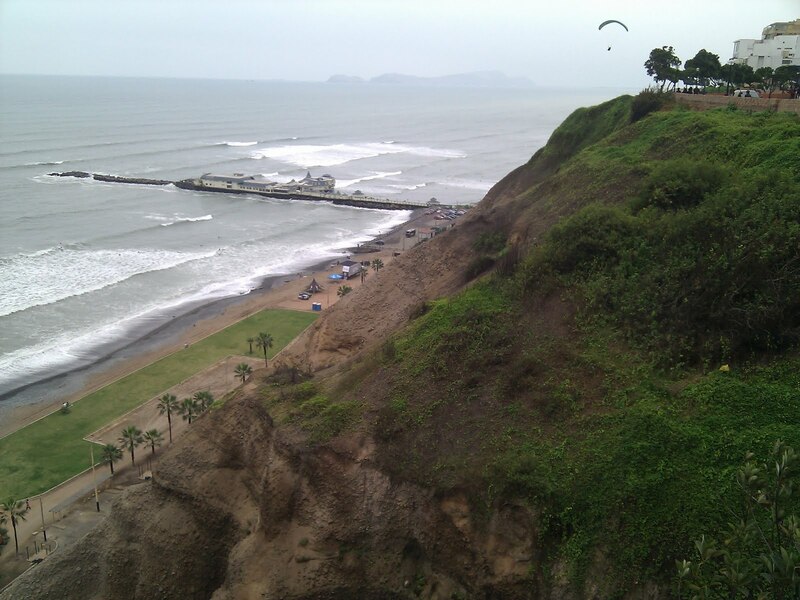 Having been inland and high in the Andes for weeks, I headed straight towards the Pacific Ocean for a change of scenery, just a few minutes away from Parque Kennedy, in the centre of Miraflores. This small, crowded park is popular, with evening craft markets. Heading down Diagonal, which becomes a green valley into the sea, I forked right onto Malecon, maintaining height. 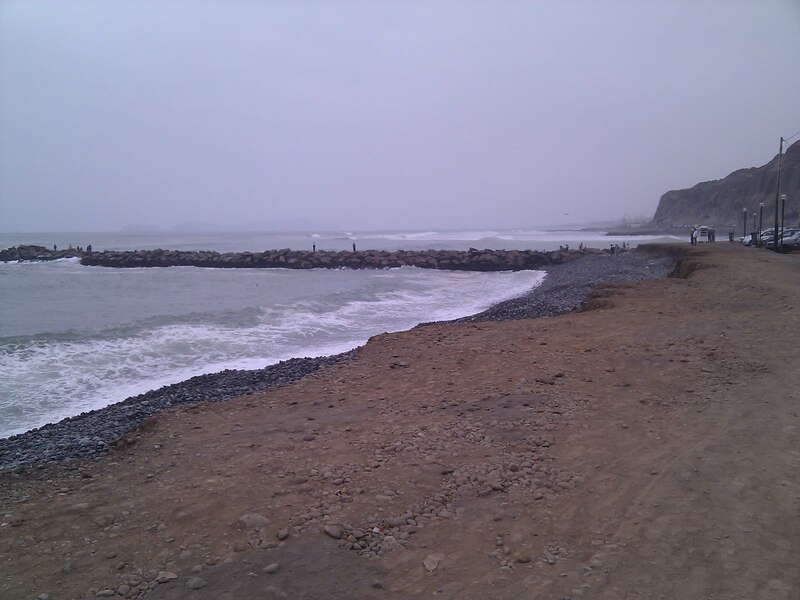 Miraflores may be on the coast but is still about 100 metres above sea level. I soon hit the clifftop where a pleasant strip of green separates city from clifftop. There were runners and cyclists everywhere, along with people practicing yoga and using the many pull up bars. There were dozens of sets of these bars, along with parallel bars and sit up hooks along the sea front. The Pacific crashed loudly into the stony beach below, pushing pebbles back and forth. Combined with a cool, grey sky this made for a great running atmosphere. Not much was visible out to sea through the haze - this is a typical climate for Lima. Ahead was a black and white lighthouse and I passed this, briefly back onto road then into another park winding along the clifftop. Further along I took a path down, no shortage of steps and the runner I passed ascending looked ready to drop. The cliff face looks unstable - large pebbles barely stuck together with earth. A busy four lane road takes traffic along the sea front, but the Pacific competes for noise as the waves crash into the stony beach. Many surfers were taking advantage of the Sunday morning waves as I ran along the coast. I passed a British style pier, which housed a restaurant, although the pier was built directly onto a strip of rock rather than the traditional iron or wooden stilts. This route leads towards the Barranco district, where a bridge took me across the road and up a narrow path, also with plenty of steps, this time taking me back up to the cliff top. Dodging the many restauranteurs keen to sell me lunch, I made it to the main square in Barranco, past a wooden railway carriage, now turned into a cafe, past the Museum of Electricity and onto a pleasant clifftop road back towards Miraflores. This way passes the Centro Comercial Larcomar - a small modern shopping centre. Someone made a brave decision to build this on the edge of a crumbling cliff. Returning to the centre of Miraflores through a grid of quiet back streets made a fine end to the run. Every block seemed to be home to a VW Beetle. A great run! This run took in just one tiny part of Lima, and didn't even get close to the old colonial centre of the city. Let me know in the comments if you have other good running routes around the centre of Lima.